As previously discussed, self-striping yarn dyeing is most assuredly a labor of love. Maybe ‘trials and tribulations’ is a bit of an exaggeration but not by much! I have always loved self-striping yarns for socks and fingerless mitts. I knew when I started dyeing I wanted to master self-striping yarn dyeing. Little did I know the time and effort it would take to even begin learning how to dye it! The initial process involved watching many videos and reading every tutorial and sleepless nights envisioning in my head how to possibly wrap and wind skeins into the proper state for dyeing it in sections to achieve stripes. Initially I found and attempted to dye six meter skeins of yarn. These were extra long skeins that came straight from the dyer in their elongated form. These worked fairly well (my own initial trials at learning to dye in general not withstanding). Yet due to the constraint of six meters (which sounds long I know but it really is not, more on that later) the sections for each color were too short. The resulting stripes from dyeing with those short sections were very thin meaning only one to two rows wide. I wanted wider stripes. Additionally, there was considerable difficulty in taking these elongated skeins and transforming them into something knitters could knit from or wind their own balls from. One method I tried was to wrap the long skeins around two chairs set three meters apart and walk around and around them to wind it into a cake or onto a niddy noddy. This was a good workout but was clearly not a long term solution. 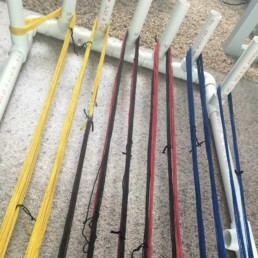 I therefore created a PVC apparatus that I could wind a section of yarn onto one section at a time. This worked fairly well and allowed me to achieve thicker stripes that were closer to what I had initially envisioned. This process involved winding the yarn from the skein (or cake if I decided to hand wind it first) onto a side of the apparatus and counting how many times I wrapped which allowed me to control the thickness of resulting stripes. I would then have to repeat the process around and around for each section. Sounds confusing? It was! Not to mention the difficulty arising if I miscounted. It was necessary to stop and count up every few rounds to ensure each section had the correct number of wraps. If I missed a wrap somewhere along the way I was required to unwind all the intervening sections and layers to correct it. I also had to put the skein back on the apparatus and unwind section by section around and around. This process worked and it worked well but it was exceedingly tedious. While developing that method from tutorials and videos online I noted that many people were using something called a warping board. Warping boards are traditionally used for wrapping yarn or thread for weaving purposes. They were doing the same process as I was. Later I discovered another way to use a warping board for dyeing self-striping yarns. I could wrap the yarn more akin to how weavers do and achieve a long skein like the ones I had initially attempted to use only a good deal longer. The initial skeins I tried were only six meters. To achieve the thickness of stripes I wanted I needed to skein of roughly twenty meters! So while a six meter skein may sound absurdly long it was in actuality far to short. I wanted to try using a warping board for winding long skeins but did not want to invest in one until I confirmed that it was a viable system for dyeing. I therefore broke down my previous PVC apparatus and converted it into a makeshift warping board. Once it was constructed I could not wait to test it out so I used a 50 gram skein to try my hand. Lo and behold it worked! Naturally a 50 gram skein will always wind faster than a 100 gram skein but I could already tell this method was much faster. With this method I did not have to count how many times I was wrapping so there was no stopping to count. I did have to develop a system to help myself keep on track with the direction of my wrapping but I quickly got it down pat and developed a rhythm. Such a long skein did present a little awkwardness in transporting and soaking and dyeing but it was not too terribly difficult to work out. I may continue to tinker with the soaking and dyeing process but the unwinding was also a much faster process. I still had to put the skein back on the board but winding off is a just a back and forth motion similar to winding it onto the board and a rhythm is again easy to get into. This new process is much faster and easier than the previous method. This means I will be able to make my self-striping skeins more often and introduce new colorways! For now I am undecided if I will redo my previous colorways as well. I could maintain them the way they are and still use my new board but I may redo them for thicker stripes. I would love to hear input from customers in terms of what stripe thicknesses they prefer. Or let me know if you have self-striping color ideas! This board may also be a potential option for attempting gradients. Hopefully all of this made some sense and gave you a peak into the journey of learning to dye self-striping. Let me know if you have questions!